The National Pork Producers Council conducts public-policy outreach on behalf of its 43 affiliated state associations, enhancing opportunities for the success of U.S. pork producers and other industry stakeholders by establishing the U.S. pork industry as a consistent and responsible supplier of high-quality pork to the domestic and world markets. For more information please visit www.nppc.org. The National Pork Board, headquartered in Des Moines, Iowa is a quasi-governmental (government-owned corporation) body of the United States government that was established under the terms of the Pork Promotion, Research and Consumer Information Act of 1985, also known as the Pork Act, which was included as part of the 1985 Congressional Farm Bill. The board is responsible for overseeing the provision of consumer information, performing industry-related research and promotion of pork as a food product, most notably through its “Pork. The Other White Meat” advertising program. The board’s activities are funded by a mandatory commodity checkoff program for cattle and hog farmers, which requires producers to pay into a marketing fund each time an animal is sold. The program operates as part of an Agricultural Marketing Service overseen by the United States Department of Agriculture. Its 15 members are chosen by the United States Secretary of Agriculture, based on nominations received from the Pork Act Delegate Body. For more information visit www.pork.org. The Colorado Ag Council is a structured entity that pulls together statewide agriculture organizations that represent and serve Colorado agriculture producers. The Colorado Ag Council acts as a forum for discussion and review of issues important and currently being considered by its member organizations. The group meets regularly while the Colorado General Assembly is in session and may also meet for any other reason applicable to its formation and at the behest of its membership. For more information please visit http://www.coloradoagcouncil.net. For more information please visit http://coagwater.colostate.edu. 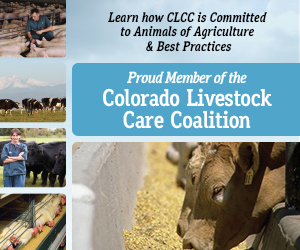 The mission of the Colorado Livestock Care Coalition is to advise the Colorado Agriculture Commissioner, livestock producers and the public on livestock husbandry practices that are humane, economically viable and supported by science and by ethical analysis. For more information please click this link: CLCC.